and from Takamatsu Airport and JR Takamatsu Station. Use an IC card “IruCa” and save money off your fare! All transportation services are run to fit in with flight departure/arrival times. Services to and from JR Hotel Clement, JR Takamatsu Station (bus stop No.3) and Takamatsu Airport take approximately 40 minutes and provide customers with relaxed and comfortable transportation. 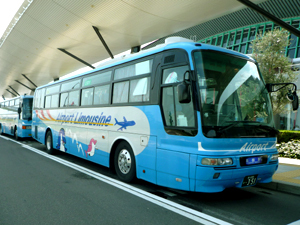 The limousine bus is scheduled to depart from Takamatsu Airport approximately15 minutes after each flight arrives. Rest assured that the bus departure time is adjusted accordingly if landings are delayed. ※ Please note that the bus timetable is modified every month according to the flight departure/arrival time. ※ Please be sure that you are bringing your personal belongings to the bus. In addition, as for the suitcases or other baggages, they can be stored in the trunk room located at the bottom part of the bus, but we cannot be responsibile in case of loss, theft or damages. Please ensure these facts before storing your luggages. Thank you.